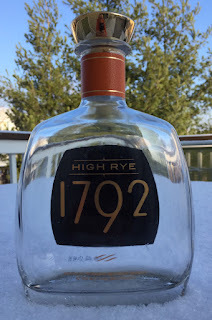 I really enjoy the Barton 1792 Small Batch, and I can say that I have LOVED all of Barton's special releases, from the Sweet Wheat to the Single Barrel to the Port Finished, which is still one of my all time favorites. So, picking up a bottle of the High Rye when met with such an opportunity was a no-brainer. I tend to favor higher-rye bourbons, so I was really looking forward to this one. The nose is delicious. It's almost entirely caramel, with vanilla and pipe tobacco seeming to linger in the background. It smells like a sweeter bourbon, which is interesting considering I was expecting it to be spicier given the high rye content. That sweet tobacco and caramel combination was a bit different than most bourbons, but in a good way. The flavor is soft and mildly sweet. On the first pour I didn't really notice the rye spice. Rather, traditional notes of caramel and vanilla were prominent. It came across as a smooth, easy drinking bourbon with a classic profile, the kind I would look for if I were to give a novice an example of what a traditional bourbon should taste like. It also had a nice middle-of-the-road texture to it, not watery but not really oily. Just kind of somewhere in between. While it is a delicious bourbon, I was looking forward to a more spice-forward profile, and it just didn't deliver in that respect. Additionally, in the first two pours there was a bit of a funky flavor that seemed to come through on the back end, almost a rotted apple type flavor--fruity yet . . . musty? It was an odd flavor, something that I've only recalled noticing in young bourbons from craft distilleries, and certainly something I didn't expect from this bottle. It wasn't a strong flavor, but just a subtle, slight oddity on the back end. As the bottle opened up, however, I no longer noticed that funky flavor, and, in fact, the spice tended to come through more, particularly on the finish. However, it wasn't the usual cinnamon spice that you get from ryes, but rather a peppery spice with more bite than flavor. As much as I wanted to love this, I found myself disappointed. This was my least favorite of their releases, including their standard small batch. That initial funky apple flavor really turned me off, and while those notes disappeared after those first two pours, it still did not live up to expectations. It was a good bourbon, but there was nothing about it that really stood out to me.